Hi, my bike is stripped and i am changing a lot of parts to make it look better. The next thing is the headlight...i wan't to change the headlight for l.e.d. H4 twin beam hi/low. Now my question is, does anyone know how to put a h4 in the original unit or is there a different unit ( h4 ) from a different bike...which will fit in the headlight unit. 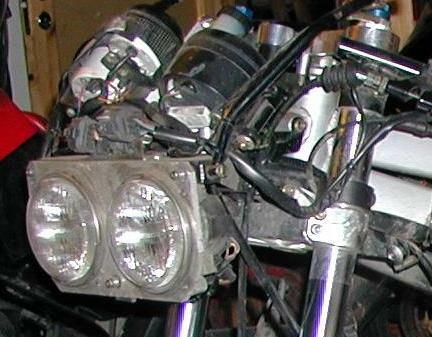 It is possible to put h4s into the original headlight shell. The fit is quite good. You just need a method to hold it in place. An ellegant solution is to devise a clip. I just wired it in. Loop a legth of wire and twist the ends together. It can not be seen when in place. The Halogen bulbs have not surcomed to the vibration and are much better. The bulbs are not in a set position determined by the tags on the disc part of the bulb so make sure you get it dipping in the right direction. I have H4 in my bb1, but not in the original headlight shell. I bought a pair of decent headlights, I believe they are from a Honda RC30 or NC30, the japanese type with the small lights. Then I put a 6082 alu plate in the lathe and turned a couple of suitable holes, and voila! we have a bb1 headlight system that actually illuminates the road at night! A thicker wire from the battery to a couple of relays also helps a lot, as the skinny OEM wires leads to voltage drop before the power reaches the bulbs. The only problem is that these japanese headlights are made for some unobtainable Honda-specific bulbs, so I had to make a pair of adaptors to fit normal H4 bulbs in the sockets. I have to cut off the two lower tabs of the H4 bulbs and push this adaptor over the bulb to make 2 new tabs in the correct position. 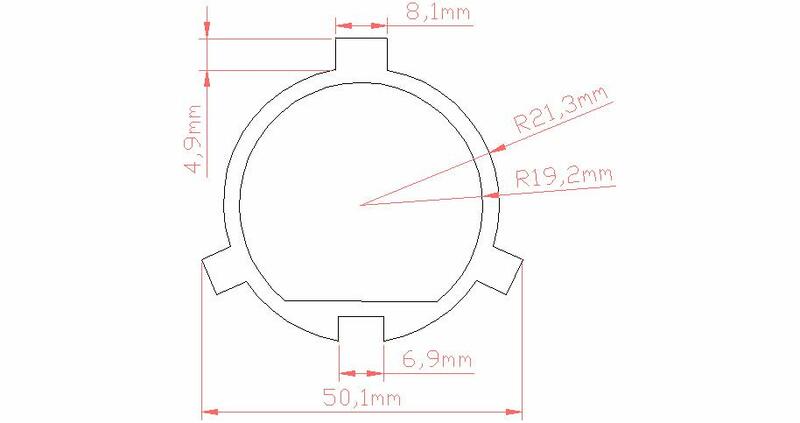 I've just bought a aprilia af1 headlight with the same sizes as the stock headlight. Pictures will be post when everything is done. Anders, nice work on the headlight assembly. Makes a huge difference when you have the right tools for the job. Great detail in the adapter diagram too. I'm currently in the middle of stripping my supermono, and the headlight is something I need to do something about. Every time I ride it, it blows its' headlights. Also - noting fearenside's observation, H4 bulbs do indeed fit nicely. I've used a piece of coathanger wire, twisted in a loop to hold mine in place. I'll order up a pair of H4 bulb connectors and make the necessary wiring changes.